After unprecedented times British boxing is set for a transitional period. By Jonny Rashman: For the past seven years, British boxing has enjoyed the most successful period in its history. Historic nights held at a packed-out Wembley Stadium, an array of world champions and legitimate worldwide superstars, has made British boxing the envy of the world. Yes, America will always be the epicenter of global boxing, nonetheless, British fight fans don’t half know how to make a boxing fight an event! Anybody who has experienced a big fight on British shores can vouch for that. The success of the last seven years has coincided in Matchroom Sports Managing Director Eddie Hearn’s foray into the world of boxing promoting. The super promoter must be given a lot of credit for the turnaround in British fortunes, especially after a string of lackluster pay-per-views combined with major broadcasters unwillingness in showcasing boxing events on their platform. It really has been a remarkable turn of events that at one stage in 2016, stunningly gave Britain the accolade of boasting more world champions than any other nation. Not bad when you include gigantic fight countries like the USA and Mexico. The Ricky “Hitman” Hatton days will always be cherished in British fight fans hearts, the fan-base he amassed was always going to be a tough act to follow. However, as much of a star the Hitman was, a new breed of British Superstars would emerge from his shadow. Anthony Joshua, Tyson Fury, Amir Khan, Carl Froch, Tony Bellew and David Haye are some of the names that have cemented their names as legitimate worldwide stars. The major success and publicity team GB boxing experienced at the 2012 London Olympic Games, lit the flame for the subsequent boom in the years that would follow. However, like a football team success comes in cycles, in a sport as brutal and competitive as boxing, it’s impossible to stay at the top indefinitely. Fighters retire, new fighters emerge, promoters have their eyes focused on other avenues and sleeping giants awaken. These are some of the scenarios that have occurred in British boxing in the last 12 months. Pay-per-view stars such as David Haye, Tony Bellew, James Degale and George Groves have recently retired, while former World Champions Amir Khan, Kell Brook, Ricky Burns, Scott Quigg and Jamie McDonnell are all in the autumn of their careers. This signifies a major transitional period in British Boxing. Although the United Kingdom has an impressive underbelly of talent rising through the ranks, in the young heavyweight prospect and power puncher Daniel Dubois, the silky-skilled Josh Kelly and 2016 Olympian and stone-cold wrecking machine Joshua Buatsi. There are justifiable questions to ask as to whether these prospects can become household names and like their predecessors become pay-per-view stars. Another point in question is British promoter Eddie Hearn’s venture into the American market. Never has an Englishman dared to take over American boxing the way Hearn is attempting. A $1 billion deal with streaming giants DAZN to stream boxing cards across America, combined with megastars like Canelo Alvarez, Gennady Golovkin and a host of other stars signing up to the platform, has sent shock waves throughout the world of boxing. The vast amount of time and effort Hearn must dedicate to ensure DAZN is a success stateside, has meant he is not 100% concentrated on the British market. This is somewhat worrying for British boxing fans, as this is the man who almost singlehandedly put Britain at the summit of world boxing and orchestrated those magical nights at Wembley Stadium, along with a selection of unforgettable events. Froch vs Groves 2, Joshua vs Klitschko, Golovkin vs Brook and Haye vs Bellew is a testament to this. The quality of fight cards Matchroom Sport has put on in the early part of 2019 has greatly decreased. The narrative of the shows is to showcase the “next-gen,” although these cards can be exciting, they are not the high-profile events British spectators have been accustomed to. While Matchroom sport has somewhat taken their eye off the ball, competition has increased with rival promotional outlets all looking for a piece of the lucrative British market. Savvy hall of fame promoter Frank Warren has enjoyed a resurgence of late, allowing him to assemble an impressive stable of fighters. Tyson Fury, Carl Frampton and Josh Warrington to name but a few. Additionally, a link up with major British broadcaster BT Sport has re-established Warren’s status in the British market, thus making him a genuine threat to Hearn. Another major player entering the British arena is the mysterious adviser-manager Al Haymon. A powerful figure in the sport of boxing, responsible for some of the biggest fights ever to be staged inside a boxing ring. Although increased competition indicates a healthy status, it’s debatable as to how long this can be sustained, with the lack of high-profile British stars in the prime of their careers. Time will only tell how long this transitional period will last and if British boxing can climb the heights that have been achieved in the last seven years. The foundations have well and truly been laid, the popularity boxing has enjoyed over this time gives Britain a tremendous chance of emulating their recent success. 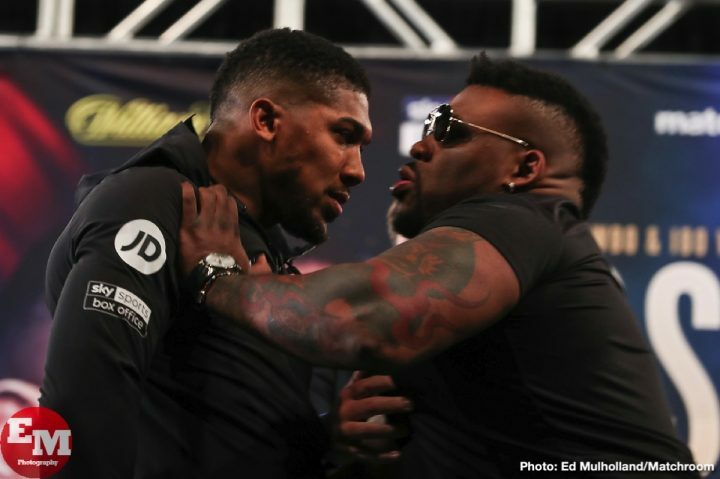 Boxing » Anthony Joshua » After unprecedented times British boxing is set for a transitional period.